You may have seen these Pizza Topped English Muffins in my Instagram feed and on my Facebook page – they are a super fun lunch idea that we make quite often. 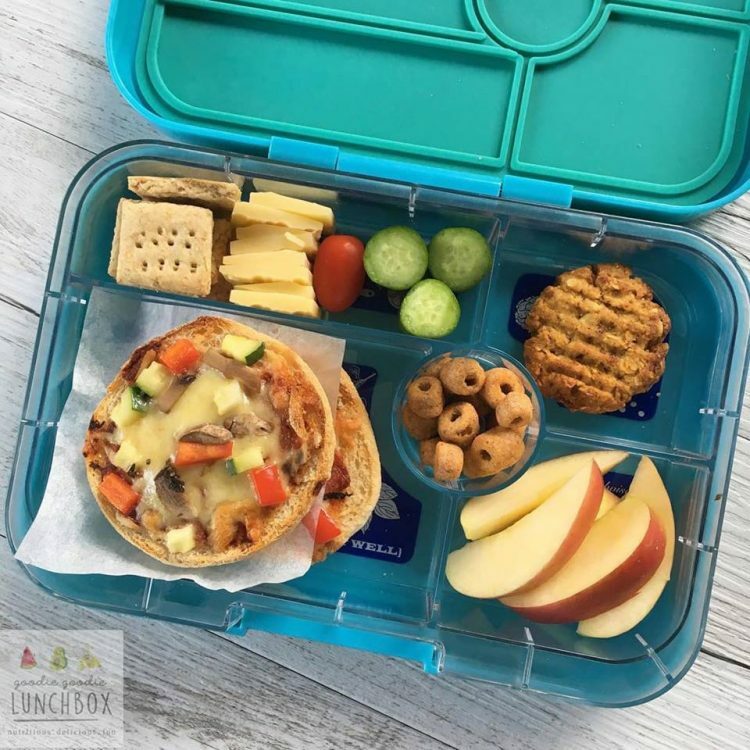 And when I pop these Pizza Topped English Muffins in Mr 6’s lunchbox? Well, that just catapults me to the status of Coolest Mum Ever. In his eyes anyway. But while Mr 6 thinks he’s getting an amazing treat I know I am getting vegetables into his lunchbox #likeaboss. And these are so simple to make. You don’t even need to make your own English Muffins. You can just buy them from the supermarket and top them with Pizza toppings. Ta daaaa – the perfect alternative to a sandwich. I personally love to add vegetables with the pizza toppings so I can bump up the nutrient factor and I find Mr 6 does not mind what is on the topping, he’s just excited to have pizza! If you are making these Pizza Topped English Muffins ahead to freeze for later use, refer to notes. The great thing about these Pizza Topped English Muffins is that they are super easy to make ahead and freeze for use during the school term. After preparing the muffins, rather than grilling, stack the muffins together with squares of baking paper in between the layers to prevent sticking. To prevent freezer burn, in lots of 4, wrap the muffins in cling film before freezing. Then you can store them flat in a large ziplock bag or container in the freezer and use as required. I prefer to make these in bulk and freeze for an easy option for school lunches. When I am preparing Mr 6’s lunchbox the night before school, I take two halves out of the freezer and defrost them in the fridge overnight. Then in the morning I grill the muffins. I then cool the muffins then pack in the lunchbox, face up, with a square of a baking paper between the halves so they do not stick together. 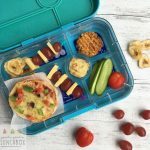 So there you go, a super simple way to get vegetables in the lunchbox and as they are freezable they are perfect to make ahead for school lunches. 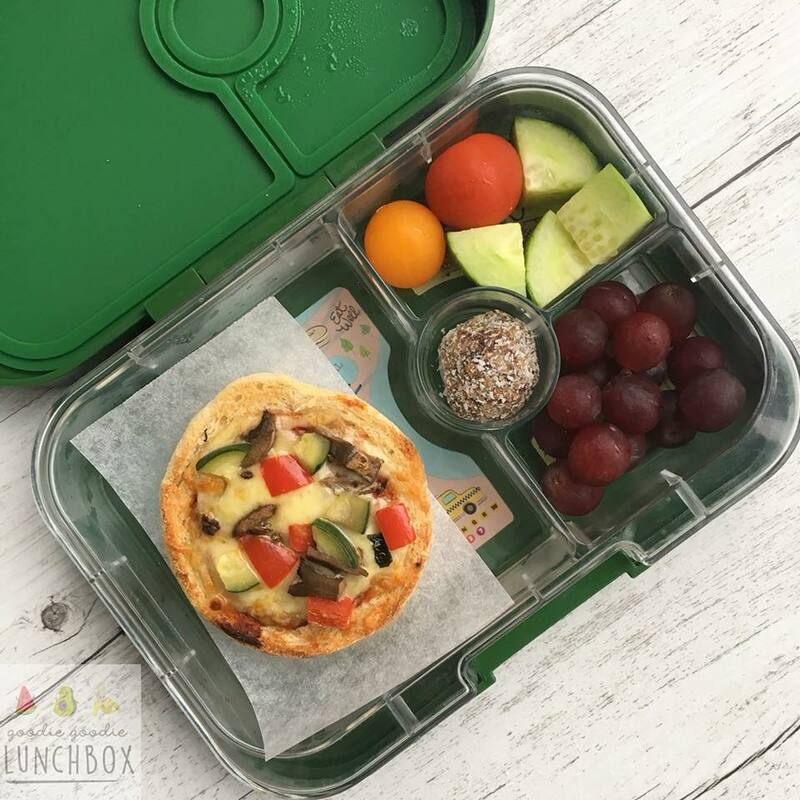 For more ideas to add veggies in the lunchbox check out my blog post all about this topic! Great ideas, I’d be concerned about choking with the grapes etc though. NHS recommend cutting them lengthways.